The HTC Desire 630 was first introduced at the Mobile World Congress (MWC) in February 2016. The smart phone was announced to be heading to India last month and now HTC has launched the Desire 630 in India. Let us quickly take a look at some of the HTC Desire 630 specs review and features. In all, the design of the HTC Desire 630 isn’t a lot different from her older siblings like the Desire 825 and Desire 830 but is unique because of the micro splash styling it sports. The HTC Desire 630 is powered by 1.6GHz quad-core Qualcomm Snapdragon 400 processor and it comes with 2GB of RAM. The phone packs 16GB of internal storage that can be expanded via a microSD card. As far as the cameras are concerned, the HTC Desire 630 packs a 13-megapixel primary camera on the rear with LED flash and a 5-megapixel front shooter for selfies. As stated earlier, the rear camera isn’t centrally located but on the top left corner of the smartie. The HTC Desire 630 runs Android 6.0 Marshmallow out-of-the-box and is powered by a 2200mAh removable Li-Ion battery. Connectivity options include Wi-Fi, GPS, Bluetooth, FM, 4G (with support for Band 40 used by some LTE networks in India). Sensors on the phone include Proximity sensor, Ambient light sensor, Accelerometer, and Gyroscope. The HTC Desire 630 also has BoomSound, Dolby audio and is a dual SIM smart phone that accepts Micro-SIM. The HTC Desire 630 comes in Graphite Grey Remix and Stratus White Remix colors and is priced at Rs. 14,990 in India about $333. 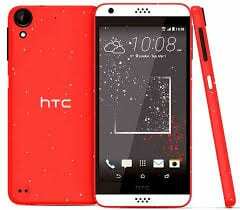 It is available through retail stores and official HTC India eStore. The phone is not yet available in Nigeria but when it does, it will fall in the price range of 80,000 – 100,000 Naira. Founded in 1997 as a laptop manufacturer, Taiwan-based HTC soon began making smartphones based on Windows Mobile and Brew. It released the first commercial Android smartphone, the HTC Dream, in 2008, and is today a manufacturer of both Android and Windows based smartphones. HTC re-entered the tablet market with the Google Nexus 9 which it released in 2014 in partnership with Google.